How I’ve missed the nerd herd! You know that moment when one of your favourite movies or books is about to be released or out in stores? It just brings along a sense of excitement that is incomparable and incredible. With the end of the Harry Potter era (although in many ways it is evergreen), The House of Night is one book series that made me profusely thank God that I still have something good to look forward to. This is just one of those things that I am completely mad about- so obviously, I don’t know where to start, and how to stop. This is one chance for me to say everything I want to, about the HoN books- I could go on and on and on. But keeping in mind the fact that I cannot possibly spoil all the fun for those of you who haven’t read the series yet, I will restrict myself to introducing the important characters and telling you what I love about them, without giving too much away. The House of Night, the vampire finishing school, is home to Zoey Redbird and her friends, who make up the 'nerd herd'- very cool people who take pride in being called ‘dorks’ (read: fans of Stars Wars, Harry Potter and the like). Zoey's dorm room now feels like my own, and Aphrodite's seems like the kind of room I hope I'll have when I win a million dollars at the lottery. While I would not say I’d go for just about any book related to vampires, I know I was tempted to read this one because it was a supernatural story. And believe it or not, I was very skeptical about it when I first laid hands on it. But was I surprised! HoN is a fascinating blend of teenage fiction and mythology! It’s very tough to explain just how well PC and Kristen Cast have made use of their knowledge of mythology as well as Cherokee folklore to give this teenage vampire drama a whole new twist. But you'll know exactly how amazing it is, when you read it. What I expected was to read another Twilight with a lot more slang and swear words. And then people started dying. The first book in the series, Marked, was a typical Chick Lit about cute guys, prettier and mean rivals, and about finding a place where you can finally belong, with friends who love you just the way you are; all that got me to read the next one was the curiosity that was building up with the suspense in the first book. (If there's one thing I cannot stand, it's an unsolved mystery.) I thought it would be the usual story with a villain who wants power, and your protagonist tries to beat them with her friends by her side. What I never expected was to find one of the most innocent characters dying, in the second book itself, at a point where you could not have even thought something sinister would happen, at a point when you do not even know where the story is heading. And you know what makes you hurt more than anything else when a character you like dies? Realizing that it was the one you could relate to most. It is the freakiest thing ever. I could say I relate to all the characters in one way or the other, however. Damien and I share a love for reading and enjoy being the studious kid who tells people to behave; Stevie Rae and I are extremely loyal and yet have a different side to our personalities that most people aren't aware of; just like Erin and Shaunee, I can crack stupid jokes in a serious situation just to make everything seem a little easier to handle (and I also swear at my closest friends, out of 'love'...); Aphrodite (!) and I are alike because we can be very cynical and sarcastic, and we take time to like people but once we do, we love them like no other; and Zoey- well, Zoey and I seem to think it's our job to save the world, we screw things up half the time in trying to do so, and can never stop stressing. Oh yes, there's one more thing- love for the Goddess. "...Even in the midst of craziness and exhaustion and life changing chaos, I was filled with peace and the sweet knowledge that I was walking the path my Goddess wanted me on. Not that the path was smooth and pothole free. But still, it was my path, and like me, it was bound to be unique." 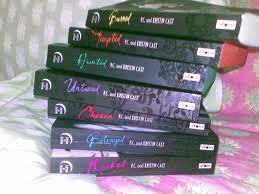 I was thinking about reading this series.. maybe I will now :).. I am currently reading "The winter of our discontent." I downloaded the audio version of book#1 cause I happen to see it. though I took 4 months to begin that , I finished all 7 parts in next 4 months ! and I loved it. Of course people here who have been from beginning know that too well. hahaha.... This is awesome. I guess its a field day today for Arpita, MSM and Nimue. God, there's another book. I will never forget that chicklit month. Loved the meme....i can feel the passion in the post. Although, I repeat, I will never read vampire YA stuff *shudders*, just like some of you will never philosophy or fantasy or god forbid, biographies. But am proud of you guys, its the passion that matters. Keep it up. True said FL .. its the passion that draws me here every day. Infact every bloody 3 hrs , i check the page still for new post , new comment .. And this meme is just this reason. To let each of us express our passions ! she has been the most fascinating, entertaining, interesting character and no matter how much i talk about her, it would just not be enough. Ahem ahem... thanks for the honourable mention there FL :P I am all with you on this one...Hi5!! !